Description: Hero Arts makes this wonderful Holiday stamp that says "Wishing you a joyous Christmas and a Happy New Year"
Size: 1 1/4" x 3 3/4"
Description: This is a wonderful saying stamp from Stamp Oasis for New Years. It reads: Good Friends, Good Times, Happy New Year. Size: 2 3/4" x 2"
Description: This is a large greeting card stamp from Hero Arts. 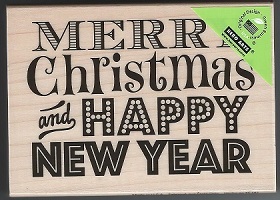 Merry Christmas and Happy New year are displayed with each word having a different and fun font. Perfect large size for your greeting cards! Size: Image size 2 1/2" X 3 1/2"
Description: This stamp from Hero Arts says "Happy New Year" in large lettering. Perfect size for your greeting cards. Size: image size 1 1/4" X 4 1/2"